The Referee Box (refbox) controls, monitors, and evaluates the game. We strive to make the refbox as autonomous as possible, ideally allowing it for an automated evaluation of the game. 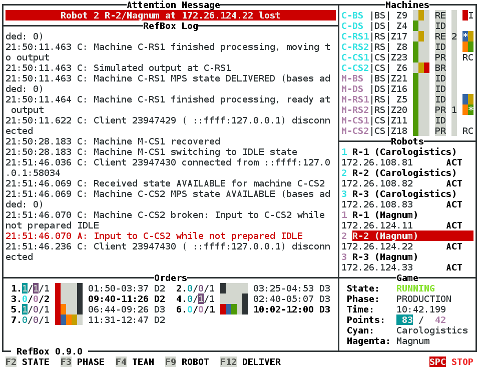 Textual and graphical user interfaces allow for human instruction and supervision (the textual shell is shown to the right). This is in particular required in unexpected situations (e.g. humans need to stop the game). The referee box also logs each and every message sent or received, all internal state changes of the knowledge-based system, as well as game-relevant reports and info. In 2015, we have published an evaluation of RCLL games based on this data. The first version of the LLSF Referee Box has been released to the public in 2013. In the following RoboCup (Eindhoven) was virtually no human interference with the games. In 2014, the referee box was adapted to the new game with two teams on the same field. Then again in 2015 it was further improved and updated to instruct the new game using MPS stations. In 2016, it was adapted for RoboCup@Work and to run a inter-league cross-over challenge. Use the following links to get the RCLL refbox and start using it on your end. Download the RCLL refbox Integrator's Manual attached to this page to read how to connect your own robots with the refbox. Please use the robocup-logistics mailing list to ask questions and discuss any issues. Mails directly to the authors will be ignored. Tim Niemueller, Sebastian Zug, Sven Schneider, Ulrich Karras: Knowledge-Based Instrumentation and Control for Competitive Industry-Inspired Robotic Domains, in KI - Künstliche Intelligenz, Volume 30, Issue 3 (Oct 2016).